The TSX series represents the state of the art in high output PSU design. A wide range of voltage-current output combinations will become available with power levels of 360 Watts and more. Each output combination is available in two versions: with conventional analogue controls (TSX) and with programmable controls (TSX-P). The heart of all TSX series PSUs is an innovative regulator design which combines switch mode pre-regulation with linear post-regulation. The pre-regulator uses specially developed techniques to dramatically reduce the capacitance between input and output thus eliminating the high levels of common-mode noise normally associated with switch mode PSUs. The linear post-regulator combines very low levels of output noise with excellent load regulation and transient response. The result is performance comparable with a pure linear design. The attractively styled casing takes up very little bench space and incorporates a tilt bail to angle the front panel when required. 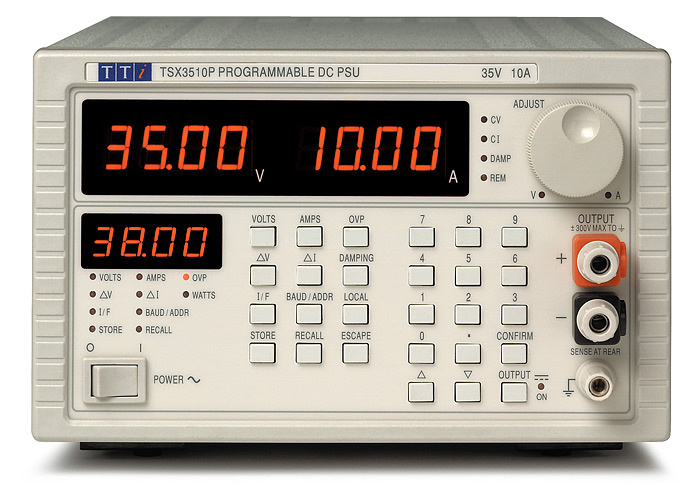 All versions incorporate high resolution digital meters for both voltage and current. V and I levels can be set to high accuracy prior to connection to the load and the limit settings can be checked at any time. 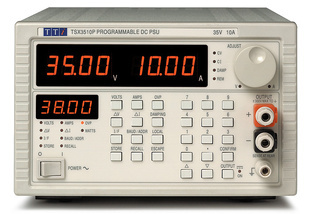 A damping switch for the current meter enables the average value of rapidly changing currents to be read. All versions incorporate a fully variable OVP trip to protect against regulator failure. The output is fully protected and other protection functions include regulator over temperature, and sense miswiring.